One of the questions we often get from our clients is "I've been saving all these photos of dream bathrooms for inspiration, but how do I get a similar look if in my own small apartment?". One of our favorite tips is to look at how the area is being used and make smart modifications to transform it into a beautiful and functional space. Changing the layout of a bathroom can completely change its look and make it appear larger and brighter. 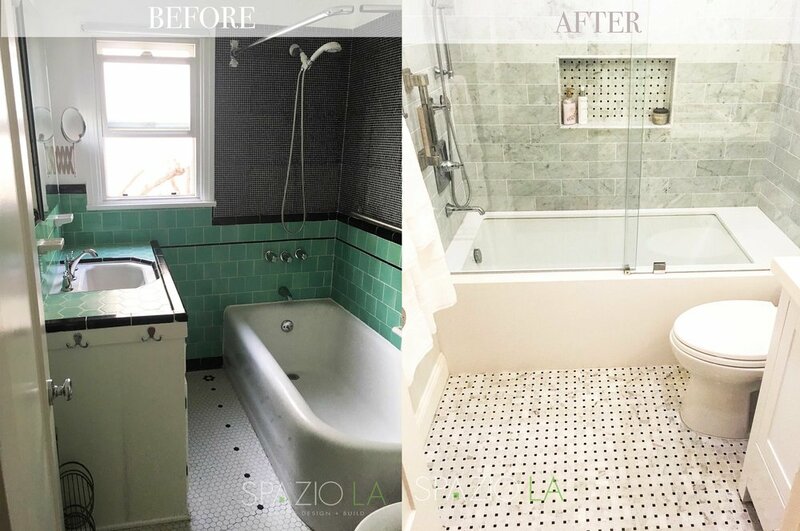 Just take a look of this bathroom that we remodeled for one of our clients. Huge difference, right? To give the impression of more space, we used monochromatic tones for the floors, cabinets and walls. The new placement of the bathtub also allowed for a large jacuzzi - and added more free room to walk around (because we know no one likes to be squeezed between the tub and the sink!). Another tip for small bathrooms is to add patterned floors, like this dotted design, that can trick the eye into seeing an expanded space. The square footage might stay the same, but the bathroom will feel bigger. A beautiful compact but functional vanity with a large mirror polished the look of this bathroom and added enough storage for all the bath essentials.